History: Manoj Gurnani founded Rupee Room in 2003 and in a short span of time has turned Rupee Room into a household name on Sydney’s Northern beaches; Rupee Room is Northern beaches finest and most authentic Indian Restaurant. Manoj was born in 1965 at Lucknow in northern India; Lucknow or Awadh, as it was formerly known, is a birth place of “dum” style of cooking or the art of cooking over slow fire. “Dum” cooking is still synonymous with Lucknow today, and is also known as Mughlai Cuisine. The cuisine created by Manoj at Rupee Room is greatly influenced by Mughlai cooking techniques which is characterised by the use of rich a variety of ingredients & spices; the result is a fantastic menu with some mouthwatering Kormas, biryanis and breads. The menu at Rupee Room is not only limited to Mughlai cuisine; most of the dishes have been created by Manoj and his philosophy behind the food has always been to keep the spices and cooking techniques Indian -from all regions of India- while using meats, seafood and produce that are locally available. Manoj’s most vivid memories of childhood revolve around food – restaurants, catering and family. The Gurnani family in Lucknow were well known restaurateurs; Manoj’s Grandfather established a world famous Indian sweet shop and Vegetarian Restaurant; Manoj’s father further expanded the business into catering, so Manoj was surrounded by hospitality elite. 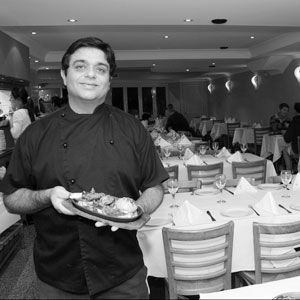 So it’s no surprise that Manoj pursued his degree in hotel catering and restaurant management and joined the family business in 1985. How would you define your style? Original, inventive, experimental and bold. What is your feature flavour these days? Fusion Indian food from India and sub-continent. Obsessive compulsive about? Quality of food & service. Your greatest culinary inspirations? My Dad & Grandfather. What do you love about this business? The relationships I’ve built over the years.